Trust me when I tell you that this is the best homemade pizza you can make. We have tried so many different variations and have found the perfect one! I should be honest...I say homemade...but it's really semi-homemade lol We buy ready made dough at Trader Joe's and pizza sauce because it is way easier and less time consuming! it's important not to skip any steps! The corn meal is key to giving the crust an extra delicious crust. They crust gets super crispy because you cook it on the stove top for a few minutes before baking. You can see above, you should get a bubbly dough before you put it in the oven! We usually stick with peppers. Sometimes onion. Sometimes sausage. But we usually always have a pepper lying around so it tends to be our go-to! We also like the Classico Pizza Sauce...it has a great flavor and we can usually get two pizzas from one jar! Sprinkle Flour on the counter and roll out pizza to a little bit bigger than your cast-iron pan. 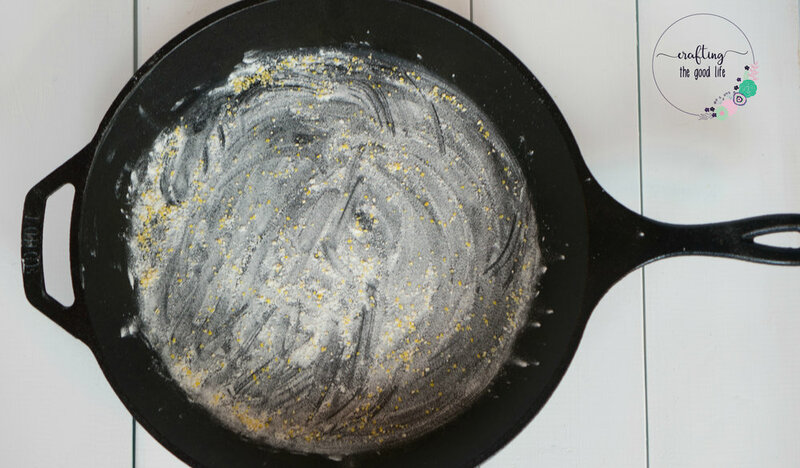 Sprinkle Flour and Corn Meal into the cast-iron pan. Add pizza dough to the pan and cook on the stove top on high heat for about 4 minutes. You want the dough to get bubbles all over! Put cast-iron pan into the oven and bake for about 7 minutes, until the top is golden brown. While pizza is cooking, cook peppers on the stove top (and any other toppings). Top pizza with sauce, toppings, and cheese. Return it to the oven and bake for about 6-8 minutes more. Mix Water, Honey, and Red Pepper Flakes in a small bowl and brush onto crust.